AFRICANGLOBE – France and Germany say they will deploy troops to Mali as part of a joint military brigade in the West African country. “France and Germany have decided to send elements of the Franco-German Brigade to Mali; the first deployment under the aegis of the EU and in an African location,” said a joint statement issued on Wednesday. The decision was made during a security and defense meeting between the two countries in Paris. The statement said the forces will join a European mission, which was launched in February last year, to train nearly 3,000 Malian forces. It did not mention the exact number of the troops involved. On the same day, European Council President Herman Van Rompuy said the EU is “preparing to renew” the mandate of the mission until 2016. Paris and Berlin also called for greater foreign involvement in training troops and security forces in the African country. Chaos broke out in the West African country after Malian President Amadou Toumani Toure was toppled in a military coup on March 22, 2012, for failing to contain the Tuareg rebellion in the north. 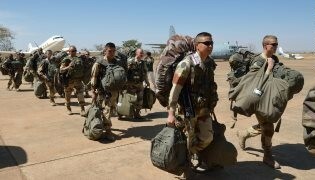 Last month, French soldiers in Mali killed nearly a dozen Muslim fighters in the northern desert region of Timbaktu. France launched a war on Mali in January 2013 under the pretext of halting the advance of the fighters, who had taken control of the north of the country. Some political analysts believe that Mali’s abundant natural resources, including gold and uranium reserves, could be one of the reasons behind the French intervention.